I measured, checked and re-measured and re-checked the hole sites for mounting the new extractor, and armed with a sharp drill and hammer function soon had 4 holes drilled. What's more they all lined up when the hood was fitted. Result. Hood is up, just the wiring, outer casing (looks like a chimney) and vent pipe to fit. Obviously standards aren't, so the new 125mm vent didn't fit in the 100mm vent pipe, and the adapter we bought also didn't adapt quite tightly (140 mm for a 125 mm fitting???) So it was time for some sealing tape. Luckily the old pipe fitted just inside the new vent and teped up with proper duct tape around the outside it will be fine. The chimney effect stainless surround had to be cut around a pipe going across the cupboards, tin snips and careful measuring and phew it looks OK. Only problem now was the last fixing bracket which couldn't go where it was supposed to due to the vent outlet plate. Again some careful measuring and drilling and that fitted. Connected the wiring to the fused switch and turned on the power. Nada, nothing, rien. So pull the socket again (shorty me trying to work over the top of the high cupboards) and found the wires had gone in too far so tightened on the plastic, rookie mistake but easily made as I couldn't see up there too well. All back together, some final checks and we have extractor. But no light. This time it was simply a bulb which had loosened in transit. Anyway 4 hours, one badly aching back but I have earned some brownie points. What should I exchange those for??? I would say you've a ways to go yet. Sounds like you did a great job though. You get plenty of points from fellow DIY'ers. You'd have gotten your full brownie point quota for paying, if payment had included fitting too, and it had been done 2 years, 11 months and 3 weeks earlier? It's my experience (sonny ) that spouses/girlfriends/SO etc. don't really care who pays. Don't really care who fits it. Don't really care how professionally it's fitted. What they really care about, is the down time from what they had, to getting back to what they had. Ask? My somewhat cynical view (borne of experience) could be wrong. As before, you've plenty of kudos from a fellow DIY'er. But from your (very) patient lady? So you think your SDS drill does holes well?, wait till you try out the chissel bits.............nearly as much fun as going out in new heels!!!!! .............nearly as much fun as going out in new heels!!!!! That takes some believing, but I've bought a cased set of Makita drills and chisels in anticipation. The Project, mentioned before, has produced some good results. Details and piccies to follow. The bathroom "Plan" took a bit of a nose dive today. So at the time we bought a new bath, and a new toilet/basin suite that came with bath fittings, although the bath wasn't part of the 'cloakroom' suite. We remembered the cloakroom suite was stylish (of course) but hadn't remembered the fittings being that great, so we bought new ones recently. The newer bath taps came with a shower mixer, which the 'suite' ones didn't, and nor would they take a hose attachment either. Looking back to the time of purchase, the single filler tap, and non-shower-mixer [non-shower attachment compatible] bath taps weren't a problem, because we were not going to be here after 6 months. The idea was to refurb/remodel in 3-6 months and put the place back on the market. We're still here, and Mrs Freddy has been promised a shower mixer in her new bath. Currently, we have an excess pedestal basin and tap, with excess bath mixers. I can barely lift the sink, so no chance of resale. Worse news is that most basins are single fill now. We also looked for a bath shower mixer in the same style as the 'suite' single tap, and Armitage don't do one. Both sets of newer/replacement taps can be returned. We only (really) need a compatible shower mixer for the bath. Mrs Freddy is unhappy with the single fill basin, but there's precious little about as an alternative. Not a great day here. Two hours trawling the internet has produced solutions. Either ...... New basin (aka sink) as it seems Ideal Standard do several 'two-tap' basins that might be suitable, as do VitrA. [Okay for me, but Mrs Freddy gets the veto on this.] Or ...... I've managed to find a shower mixer in the same style as the suite taps. New basin and pedestal £75 delivered. Bath shower mixer £118 delivered. Some would say an easy choice? Go for the cheaper one and a new pair of shoes with the money saved. Problem solved by hh4evr1, so pics of the new shoes soon??? Spent the evening going through the options with Mrs Freddy. After 2 hours, she'd given up and started agreeing to anything I showed her. I found some inexpensive two-tap pedestal basins that go with the toilet. I also found cheaper versions of the £118 taps too, as well as a wider range of them. The bottom line isn't just cost, though there is a budget. The new bathroom has to look like it belongs together, not like we used Dr Frankenstein's Bathroom Designs Ltd. Even if we move quickly, we'll be using this stuff for maybe a year. It's got to function, and stay 'fresh' looking. I can't tell you how frustrating it is, not being able to take photographs at the moment, with so much else to do. But soon! We have a new bathroom suite that I have agreed will be fitted by a 'proper' plumber. I have dug out the original (avocado) toilet today, to put some thin board underneath it to help level out the curly floorboards. With the toilet out of the way, we were going to remove a large section of old redundant boiler flue, and offer up the new toilet to see how it looks. Firstly, let me tell you that living in a hard water area provides interesting insights into the formation of stalactites and stalagmites. Not the sort you are used to, but inside the bore of the toilet flushing system. I would say the pipework I moved today hasn't been touch for the 35 years the house has stood here. The 30mm bore of the water outlet to the toilet, (where the water exits before running around the bowl) was barely 20mm in diameter. The supply pipe, had what looked like 15mm of wax laying in the bottom of the pipe, and was actually solid limescale. Disengaging the toilet bowl from the soil outlet, revealed the cause of the 'nasty' drip we've endured for 2 years. The seal is not intact. Not yet looked at removing the remaining part of the redundant flue stack. Looks simple enough, but ..... If it isn't removed cleanly, there's plenty to damage if it gets dropped onto the central heating pipework below, on the ground floor. The (real) reason for the plumber, is I want the soil stack moved to where the old flue used to be, about 250mm closer to the corner of the room. I have no enthusiasm for juggling 3m pieces of 110mm plastic piping, so intend to hire someone with that enthusiasm. Once that's done, the new toilet+basin+bath can be installed. Mrs Freddy is quite excited, as she has been waiting 2 years for the bath we've kept in one of the bedrooms, to be plumbed in. She doesn't get to see the blood, sweat, tears and more blood, these jobs need to be completed. But apparently I'm going to be very popular with her, when it's done. My excitement at the prospect of installation, is (i) freed up space - no bath taking up space, and (II) the hindsight experience of what seems like at least a handful of enigma's. Meaning, at the moment I have a number of problems with no immediate solutions. When the jobs are completed, I'll know how it should be done (having done it) and next time these problems will seem like much smaller hurdles. We are going to offer up the new toilet and sink to pretty much where we expect them to be fitted, so we can see if they both look the part. If "yes", we keep the sink. I've found a couple of styles of basin+bath mixer/shower taps that tick all the boxes, and combined come in at around £110. No saving, but selling the 'supplied' taps would produce a lot more return than trying to sell a sink. Plus we have to sell the bath taps whatever happens, so might as well sell them as a set. I'll be happy if I see £30 back. At this time, I'll be happy to see the back of them. As previously reported, I have acquired an SDS+ drill for hoofing my way into concrete. The drill was a Ni-Cad system, and I'd gotten fed up with always finding the battery flat. I have a fast charger, but waiting 30 minutes to do 2 minutes worth of drilling can be frustrating, so decide at the end of 2012 to invest in a Lithium system. In fact, I decided to invest in two. I spend a lot of time changing drill bits (pilot <> full-size <> countersink) so thought I'g get two cordless drills. Stanley Fat Max ticked every box. Double discount from Homebase meant the system cost me £80 each. That included two batteries too. 3 year warranty, so I bought two of them. Within days I'd somehow broken one of the chucks, and the drill was immediately replaced, no hassle. Since then I realised the other had a wobbly chuck, and by now I'd given up, so got a refund on the second unit. The remaining good kit, I'm going to sell on in bits. Hopefully the batteries will sell for the price of the whole kit? Upshot to this disastrous buying decision, is that I had to look again. Sad really, because the drill I still have works really, really well. But I need two. Decided I'd give AEG a go, over Makita. Have bought two 18v C Li (drill drivers) and one 18v G Li (drill/driver/hammer). Yes, I know, 2+1 equals 3, but ...... The batteries on the second C Li system are probably worth about what I paid for the kit. If I sell them on, I get the drill for nothing. I think there's a fair bit of this going on too. Even the retailers are getting in on it; breaking up kits. People like me need a second drill, especially if they got 2 batteries in with their kit. Some need to replace worn out batteries. Some need to replace chargers. Breaking up a kit makes financial sense. So, I'm hoping to have two drills with a battery for each, for the price of one kit. For when I want to gently drill a hole in brickwork, I have the 18v hammer drill. So I'll have 4 batteries and three drills. I can't imagine a job that'll need four batteries, but if there is one, I'm ready. Incidentally, the AEG C Li is a 'compact' 18v drill driver with 47Nm of torque. Couple of interesting/useful features: Battery charge indicator that works with the battery both mounted and mounted from the drill. And an LED illuminator that actually lights up the job. Although the second drill I bought is going back for replacement (another wonky chuck), these systems come very highly rated. Nice grip, good trigger response. Chuck doesn't undo itself (freeing the drill bit) while in use. Not used the G Li for drilling brick yet, but it performed well today helping me screw down floorboards. I hope to give it some brickwork drilling later in the week. The second C Li was swapped today at the suppliers. Chuck wasn't rotating very concentrically on my second unit, and is a well documented problem with hammer drills, though the C Li doesn't have hammer action. The swap was effortless, and this time I checked it before leaving. I'm very happy. The AEG kit I've bought, is highly recommended. The house had a serious stab at giving me a breakdown over the weekend. We've always had a problem with a small water leak around the loo. The chief suspect was a pre-made hole used for a flush lever. With one on either side of the cistern, it was possible to configure a left or right handed flush. The leak was suspected to be from a poorly fitted bung in one of these holes. Repair some floorboard. Remove toilet and place hardboard to cover to rippling floorboards, install two new mains water feeds (sink/bath and loo) then reinstalled old toilet. Simple? The floorboard bit was awkward but straightforward. It's temporary, as a new loop to supply the new rad has not yet been installed, but it's going to happen. So, the 'final fix' of the boards will be completed after the rad goes in to keep access maximised. Removing the toilet pan wasn't hard, as I'd already installed an in-line isolator, when I repaired the syphoning system some time ago. Emptying all the water from both cistern and pan wasn't pleasant. The seal on the loo outlet came off in pieces. The connector to the soil had to be sawed off flush, then carefully split -with a saw- as it couldn't be withdrawn from the downpipe. Cleaning and disinfecting so it was safe to touch, another unpleasant job. Once the utilities 'shaft' was open, adding the two new pipes was a challenge, but do-able. I must take a picture. Putting the toilet back was easier with the new type of connector joints, along with copious use of silicone lubricant, "Lucky" for me (a phrase I never get to use) the replacement connector system must have been designed for me. No cutting, no jiggling, fitted like the proverbial glove. Connected the water supply, and all seemed well. It wasn't of course ... But seemed it. Firstly, the dilapidated syphon system refused to flush. I'm sure being dried out meant the diaphragm wasn't as well fitting as it was before I started the work, not that it would have been that well fitting before I started...... It took 20 attempts over 10 minutes to produce a good flush. Today, a day later, it's back to its old form. Not great, but you don't need to say a prayer before using the thing either. The worst problem by far, is the return of the drip. The symptom has been a slow but constant droplet loitering on the underside of the cistern. As I'd cleaned off all the old residue, [aka limescale], the new drip was extremely prominent. And damp, obviously. Turns out, the cistern has a hairline crack in it. Invisible on the inside, where a line of silicon sealer would solve the problem, but a finger nail dragged across the surface of the cistern reveals not a thin line of limescale as previously thought, but a hairline crack. This discovery means one of three things must happen quickly. 1. I relocate the cistern from the ground floor toilet - also due for replacement. 2. I spend £24 on a non-matching [temporary] plastic cistern. 3. I install the new complete toilet a month ahead of planned installation. Currently, Mrs Freddy has proposed/seconded Option 3. Not least because she has been looking forward to planting her body on sanitary ware used by no other mortal. Especially not the one previous owner, to who hygiene and cleanliness were absent friends. Having worked out/implemented 'a plan' so successfully, to have an invisible crack thwart me, is really quite trying. Not least because it must have been there when we bought the house. Meaning the (one) previous owner of 35 years, must have known both that it was cracked, likely how it became cracked, and sold it to us knowing there was a problem. More news as it happens...... Hopefully, Friday 3rd. Water leaks are a feature of our house, so I know your pain. When we replaced our downstairs cistern flush we could not get the tank to seal to the toilet as it was fitted directly on top of the toilet. Our neighbour is a retired plumber and tried all sorts of sealants he had. I ended up using some tricks I use to seal things at work and used multiple rubber gaskets even on sides of plates which shouldn't need them. Water is amazing, I can work on oil systems running 2000+ PSI and seal 99% of the time first time, but 15 PSI of water pressure will leak 99% of the time for me. We have had a leak we can't find under our bath for over a year, it has holed the downstairs ceiling but we still can't see what is leaking to cure it. A basin tap connector weeped for long enough, out of sight, to cause the cupboard and floorboard to swell, and our roof leaked into our bedroom causing a hole in the ceiling and loads of bowls to be deposited around so we could sleep for the night, and all in the last year. Water leaks, no fun at all Freddy, so I hope you get it sorted soon. but 15 PSI of water pressure will leak 99% of the time for me. I use Fernox LS-X on any water joint except end feed solder joints. Yes. even compression joints get the gooh. It's not cheap, but it works. 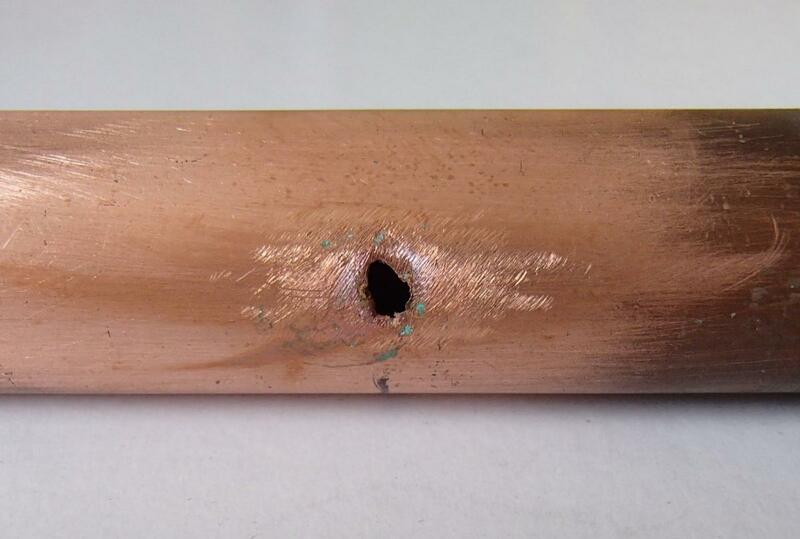 Last year we had a copper pipe decide to leak. Brought the ceiling down, had the ground floor awash. 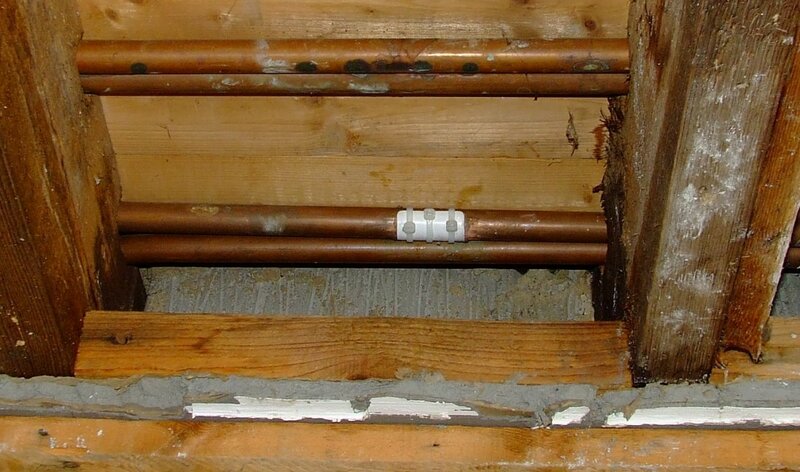 22mm pipe, right next to a joist and floor boards. Not supposed to be that close .... But this is the house Bodger Bros and Sons built. So no way of soldiering a joint. Couldn't take the floor up, without moving built in cupboard space above it first. (Days worth of work to gain access.) As the water was indirect, I fashioned a shaped (round) patch from a redundant plastic membership card, that started life looking like a thin credit card. I put a 2 mm layer of LS-X around the hole, and used 3 tie-wraps to keep the patch in place. Well over a year later (I think) the patch is still doing its job. Sadly, it didn't stop another hole appearing 2 months ago, about 2 ft from that! Wasn't as easy, but used the same method. Luckily I hadn't repaired the ceiling, so access was easy. The pipe is going, so the first chance I get it'll be removed or at least blanked off. Did a similar bodge last Autumn with a gutter. Got fed up with water running out of the gutter through a joint (that has been repaired -badly- by the previous owner). Another membership card (or phonecard), LS-X'd it up. 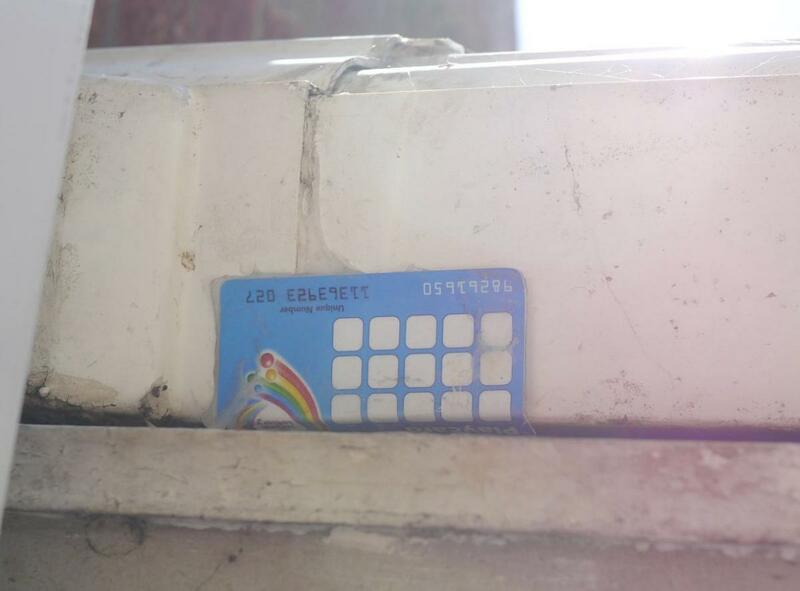 Shaped the card around the gap, no more leaking gutter. Did it while it was pouring down too. Wonderful stuff. If I had used a white card, I could leave it there, but it's a dark blue O2 card if I remember, so will need replacing. Sounds like I need Fernox LS-X and some Unibond Extreme Repair Sealant to fix my house. The roof was a badly cracked tile which a neighbour kindly replaced using his wooden ladder, looked a little rickety for my frame lol. The Friday plan for the new loo came and went. Offering up the new pan and the cistern together, not previously possible because temporary removal of the old cistern was possible either, I found the location of the new supply pipe was out by 30mm. Too close for additional pipework, not close enough for a little light 'bending'. Plan B (though more likely K or L) had me watching 5 or 6 You Tube DIY 'how to' video's to see if there was something of a solution out there. Seems just about everyone uses a braided flexible connector to make off the last 300mm of pipework. I'm guessing, this allows for changing the toilet, without the need to change any other plumbing. 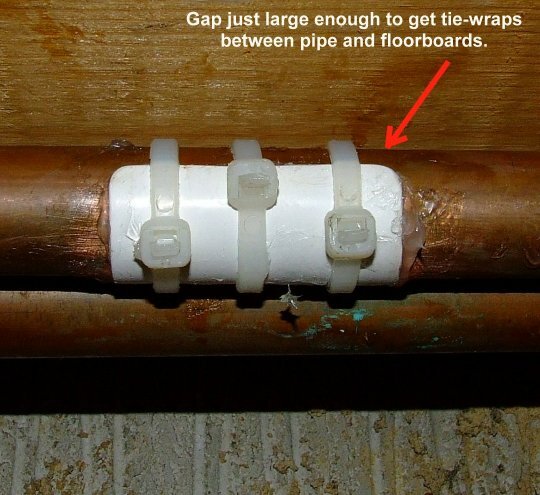 To use this method, required the removal and re-cut of the my newly installed supply pipework. The loop I made, needed to be positioned lower, to accommodate at least some of the proposed 300mm flexible connector. I really, really, really, didn't want to be doing this. All of the joints I'd made other than the soldered loop, where made with compression joints. I do mine up so tight, they're seldom fit for re-use. The compression joints are used to allow replacement of pipework where the use of a naked flame is either undesirable, or plain dangerous. In this location, it would be both. So a flexible connector was bought, and a nice bit of kit it is too. The completed section of the pipework was made ready for re-cutting, mains water turned off, and most of the upstream circuit drained. A couple of nerve-wrecking hours later, it's all reassembled. I have a horrible feeling one of the joints I didn't remake has a minute leak. Given how pretty the whole thing looks now, I'd be happy to replace that bit of pipe if necessary. The job looked nice before, but looks even better now. If the leak turns out to be a stray drip of water, the toilet gets located tomorrow. I'll happily forgo the warmest day this year, if I can get this job wrapped up. Just call me Bob the Builder. My weekend was spent putting up blinds, shelves and car repairs and servicing. I did get a great new tool for diagnosing car faults though which connects to the cars computer and bluetooths to a phone for real time fault readings. Also had to cut and mitre some cupboard edgings in the kitchen to go around the cupboards where the new extractor went in. All went ok so nothing to report really apart from the shelves going on plasterboard walls, and two shelves on two walls I managed to hit two bits of the supporting wooden frame so couldn't use the plastic plasterboard fixings, which reminds me to ask how can anyone call the plastic plasterboard fixings easy and no drilling required when without drilling first the end wears away before it starts in, or the top where the screwdriver goes in just breaks off before it's half way in? I had to drill almost to the size of the plug shaft to get it to wind in. ........ the shelves going on plasterboard walls, and two shelves on two walls I managed to hit two bits of the supporting wooden frame so couldn't use the plastic plasterboard fixings, which reminds me to ask how can anyone call the plastic plasterboard fixings easy and no drilling required when without drilling first the end wears away before it starts in, or the top where the screwdriver goes in just breaks off before it's half way in? I had to drill almost to the size of the plug shaft to get it to wind in. Only ever had two fail, and that's because they don't work well when you try to screw them into wooden studding... as the tips tend to bend. You can see from the end, a Philips screwdriver (aka crosshead) is used to turn the insert which is self drilling, self tapping. When the insert is installed, the (supplied) screw is used to complete the job. These are light to medium weight fixings. Hanging a fridge off a stud wall might need something a little stronger. I always felt screwing into studding was a good thing, as it has to be more secure than plasterboard alone. Plasterboard might be okay for shear (downward) strength, but studding must be more secure for any push/pull force which I imagine could produce a nice large hole in plasterboard? Sounds like you've had a very busy weekend. Busy Saturday, rested a little Sunday and today. I was using the plastic version of those metal Driva fixings in your post, they're only holding shelves which will bear hardly any weight, As you said where I hit the studding I screwed in directly. "I have been using my box of Screwfix nylon fixings for some years with great success and have recently used them all up, but the only nylon wall fixing in the Screwfix catalogue now is this replacement from Rawl which has several important design flaws which make this fixing annoyingly useless. Firstly the fixing is inserted using a pozidrive screwdriver and the hole in the centre means that the driving notches for the screwdriver are only about 1mm deep. This means that somewhere around the final turn of inserting the fixing in the wall, the torque required is great enough to shear the nylon, leaving you with a stripped fixing standing proud of the wall by about 4-5mm. The old screwfix items were driven by an insertable flat blade which neatly avoided this problem. Secondly the screws included with the fixings have a thread length of 32mm, however the nylon plug has a blind hole with a usable thread depth of only 22mm. This means you cannot fix a flat plate to a wall with the supplied screws! The blind hole means you have to find exactly the right length of screw for each application, too short and there will be insufficient bite of the screw, too long and the screw won't tighten up against the fitting and you'll strip the plasterboard hole. 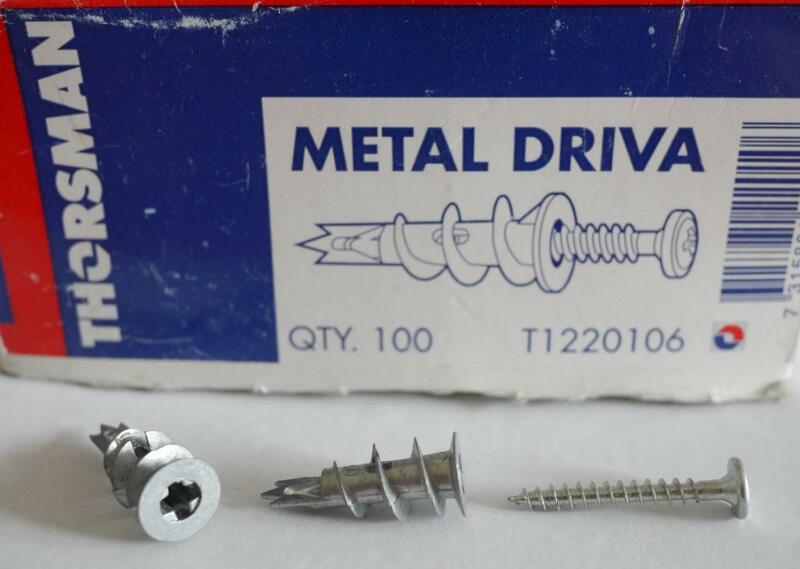 The older Screwfix plugs were better designed with open holes which accepted longer screws with no problems. Thirdly the moulding has an attempt at a nylon pilot hole drill designed into the blind end. It looks good, but unfortunately this makes no impact on my plasterboard walls due to the softness of the nylon, needing a metal drill to make a starter hole. The older Screwfix plugs allowed the flat insertion blade to poke through the fixing and act as an excellent pilot hole cutter. So there we have it, progress means replacing a perfectly good Screwfix nylon wall plug with a badly designed Rawl item complete with screws you may not want which doesn't really work. The Rawl fixings will be shortly appearing in my bin. Please bring back the Screwfix ones, I'd be happy to pay more for something which has been proved to work!" This is not an unusual experience from reviewers, as with your own difficulties ? I think I'll be sticking to my 'Old School' metal ones. The fill hole in the cistern is undersize. I can get the filler tube in, but the washer that centres the tube won't enter the hole. Worse, the filler touches the side of the cistern, except in one position. I can get a piece of paper inbetween, but it has to be in EXACTLY that one position. I either need a large diamond file [15mm diameter being ideal], or access to a good quality sintered diamond core drill. Not happy. Meantime we have a new toilet, which Mrs Freddy is very happy to see (and use). Although I'd sanitised the original one many many times, including one clean up I was particularly proud of (½" of limescale removed from 'the bend') herself never liked using the thing. The bathroom replacement includes a two stage plumbing change too. I am converting from indirect to direct water feed. This means removing 22mm piping and replacing with 15mm as it's much more efficient at moving hot water. [Less wasted water before the heated water arrives, less -unused- hot water left in the pipes.] As we don't yet have the new combi boiler, we are at a stage where I can change the cold fill, and only prepare the hot fill route. Yesterday I changed the cold fill for the sink (to be fitted) and the old bath to direct cold fill. It allowed me to improve the flow rate of the hot water route, but as I have to keep the 22mm indirect feed for another couple of weeks. 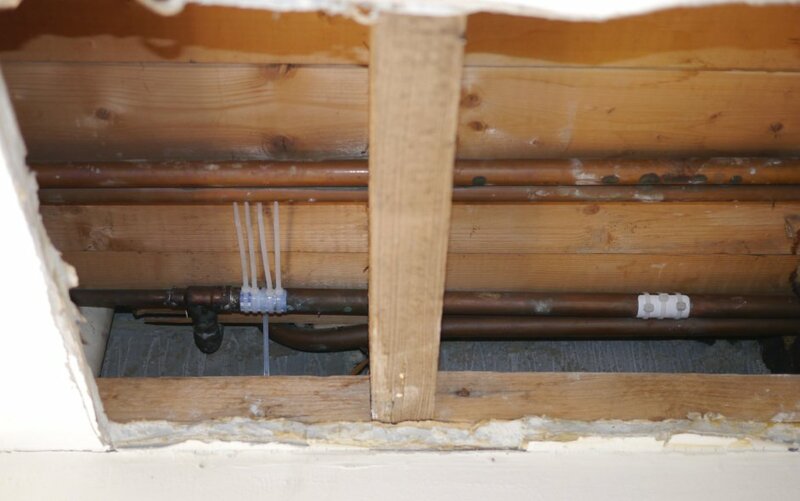 I planned to re-use some of the old 22mm pipework to save money, and some time. Probable cause; plumber failing to clean off acid cleaning residue, after soldiering a joint. As mentioned before, we've had a couple of leaks from this 22mm stuff already, and spotted a couple that have self-healed [limescale] in the hot water route. All of the leaky pipe is to be redundant. Best sooner than later?